In the Times Higher Education (THE) World Reputation Ranking 2017, LMU Munich is ranked 42nd overall. It thus retains its status as Germany’s most highly respected university. For the 7th year in a row, the Times Higher Education (THE) World Reputation Ranking is headed by Harvard University, and the runners-up -- Massachusetts Institute of Technology (MIT) and Stanford University -- have also successfully defended the positions they occupied in last year’s list. 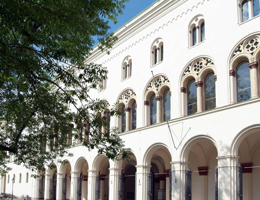 LMU is placed 42nd and thus remains the only German university in the Top 50. The THE‘s World Reputation Ranking 2017 is based on a worldwide survey of 10,566 academics from 137 countries. The scholars consulted were asked to name no more than 15 universities which they personally regarded as being the best in their own respective fields. The survey data used for the Reputation Ranking represent the collective, but subjective judgment of the global scientific community, together with 11 other, objective indicators form the basis for the World University Ranking 2017-18, which will published later this year.